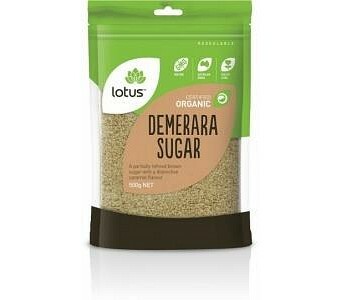 Demerara sugar undergoes less processing than most brown sugars, leaving it with a more pronounced taste which, although complex, is most often described as caramel-like. Make your recipes more intriguing by substituting Demerara for ordinary brown or white sugar, or use it as a naturally crunchy sweet topping for baked goods. Ingredients: Organic Demerara Sugar. Certified Organic by ACO.